The Expert Talk Series is organised by the Young Leaders of the Ceylon Chamber of Commerce. 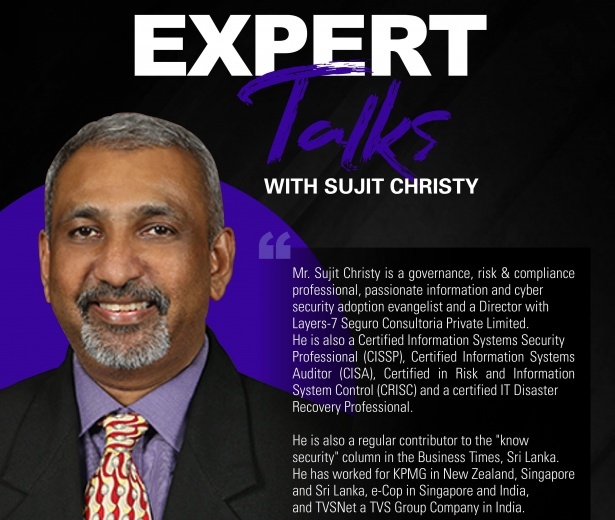 The inaugural Expert Talk Session features Sujit Christy, who is a governance, risk & compliance professional, passionate information and cyber security adoption evangelist and a Director with Layers-7 Seguro Consultoria Private Limited. He is also a Certified Information Systems Security Professional (CISSP), Certified Information Systems Auditor (CISA), Certified in Risk and Information System Control (CRISC) and a certified IT Disaster Recovery Professional. As the world becomes increasingly connected and the Internet of Things (IoT) continues to expand, consumers' concerns about the hot-button issues of data security and privacy are deepening. The proliferation of connected devices coupled with consumer unease sends a clear message that in order to build trust, organizations must address privacy concerns, safeguard data and be open and honest about how personal information is collected, used and shared. A strategy for enabling consumer trust and enhancing reputation and growth is needed, and protecting data privacy is critical in today's global digital economy. This expert talk will offer solutions to some of these challenges and also discuss the issue of more widespread education and communication of threats and how they might be better managed to preserve privacy and security. Venue: The 6th Floor Members Lounge, Institute of Chartered Accountants, Colombo 07. Don't miss this inaugural session of the Young Leaders' Expert Talk Series! Click here to register.